It’s very challenging for kids to master capital letters and periods, isn’t it? I work a lot of it, as do you and your students. They have such a tough time remembering to use correct punctuation and correct capitalization in their writing. This fall, my second graders especially needed some extra practice. In the past, I have found it helpful when students practice by editing writing that is not theirs. To this end, I created an editing practice activity! 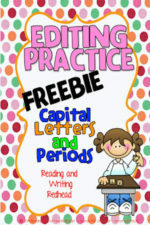 With this activity, students will be checking for capitalization and punctuation errors. You can grab it for free by clicking here or on the image below if you’d like to try it with your class. 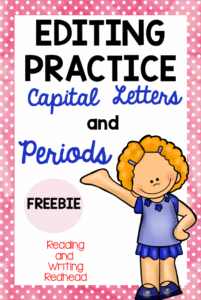 Grab this editing practice freebie – students will edit for capital letters and periods. Watch their own writing improve, too! If you download it and can take a moment to leave feedback on TPT, I’d be very appreciative! Thanks! This post appeared at Classroom Freebies. 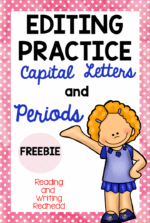 Do Your Students Need Help with Capital Letters and Periods?